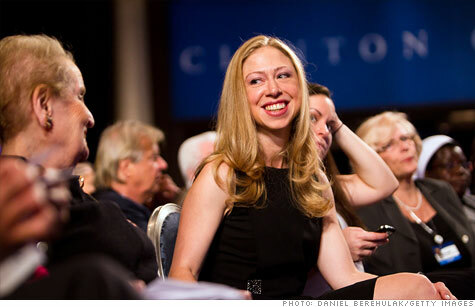 NEW YORK (CNNMoney) -- Chelsea Clinton has joined the board of directors at IAC, the Internet media giant said late Monday. IAC (IACI), headed by media mogul Barry Diller, said in a regulatory filing that former First Daughter Clinton was elected to the post on September 22. IAC operates more than 50 Internet companies in 30 countries, including Match.com, CollegeHumor and Vimeo. It also retains a 50% stake in The Newsweek/Daily Beast Company, after launching The Daily Beast in 2008 with Tina Brown. Clinton, 31, is currently serving on other boards -- but they're quite different from IAC. She's a director at the Clinton Foundation, the School of American Ballet, Common Sense Media and the Weill Cornell Medical College. Clinton is currently pursuing a Ph.D. at Oxford University and working at New York University. Before that, she worked at McKinsey & Co. and Avenue Capital. Also elected to the IAC board is Sonali De Rycker, 38, who is a partner at London-based global venture firm Accel Partners. De Rycker previously worked at Atlas Venture on investments in the Internet and software sectors. She was formerly an investment banker at Goldman Sachs. De Rycker also serves on the boards of several private companies. Other IAC board members include Diller, former Disney (DIS, Fortune 500) CEO Michael Eisner and former Sears (SHLD, Fortune 500) CEO Arthur Martinez.